I’ve never baked with such a heavy hand…. 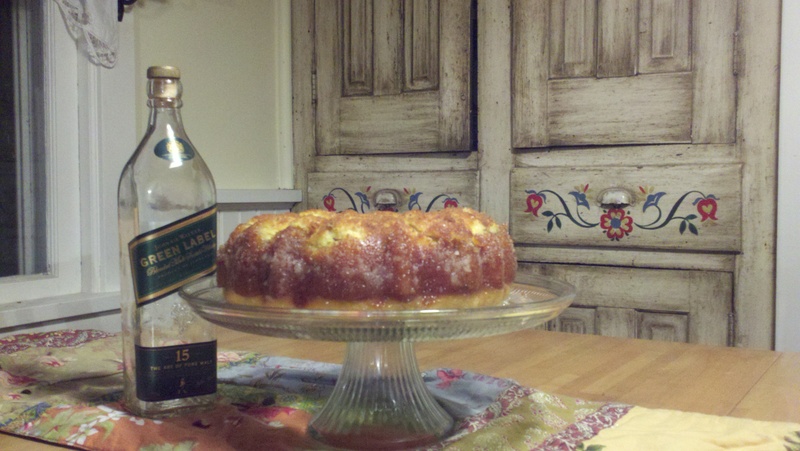 until I made this Irish Whiskey Cake! The recipe was given to me by one of my fellow nurses, Jytte. Jytte is originally from Denmark and this is an old family recipe of hers. She made this cake for our work Christmas Party and I couldn’t even get through the first bite before asking her for the recipe. This cake is soo moist and the flavor is unreal. I found it to be delicious and I’m not even a Whiskey drinker! Combine cake mix and pudding mix. In another bowl, mix together milk, oil, and whiskey, then add these ingredients to the dry ingredients and incorporate. Beat in eggs one at a time and continue mixing until smooth. Stir in the walnuts. Pour batter into a greased bundt pan and bake at 325 for about 1 hour or until it tests done with a toothpick. Prepare glaze by melting butter in a saucepan. Add sugar and water. Bring to a light boil then simmer 10 minutes, stirring frequently. Remove from heat. Let cool 3 minutes then stir in whiskey. When cake is done, remove it from the oven and pour glaze over cake in pan. Let cool for 1 hour then turn cake out onto plate. Let cool completely.